← (not so) Fun Friday: An Open Thread, A Farmer’s Market, and More! Gerry Adams To Visit the Inner Sunset June 27th at St. Anne’s! Here’s something you don’t see every day – an international political figure visiting the Inner Sunset! Gerry Adams, the president of Sinn Fein, will be the host of a forum entitled “A United Ireland – How Do We Get There?” at St. Anne’s Hall over at Funston and Judah. There is no charge to attend, and everyone is encouraged to attend and ask questions of Mr. Adams, as well as a panel of Irish and Irish-Americans. Many people locally have worked hard on this event, so if you’re interested in the issues regarding Ireland, you should definitely attend and bring any questions you may have for the panel. It’s being held right here on the N Judah line, and the discussion should be interesting, so check it out! When space permits, I like to highlight events that may be of general interest to the readership. If you have an event, please email me information and I’ll do my best to get it on the site, space and time permitting. Thanks! This entry was posted in Links of Interest, Urban Life and Culture. Bookmark the permalink. 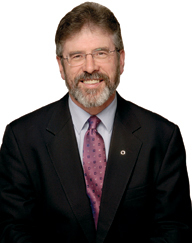 3 Responses to Gerry Adams To Visit the Inner Sunset June 27th at St. Anne’s! “A United Ireland – How Do We Get There?” “With Muni, of course.” Tee hee. Not sure if I can make it to the event…which pub will they be at afterwards?